S2E214: "White Pass with Jane Isakson"
White Pass is located in the southwest corner of the Yukon Territory near the Alaska border. As it is situated at the convergence of the wet Pacific coastal and the dry mid-continental climatic zones, this landscape is characterised by fierce storms and rapid seasonal changes. Working amid White Pass's chiselled mountains, gnarled trees, and crystal clear streams, painter Jane Isakson investigates the area’s colours and unique landforms. Later in the studio, Jane abstracts her earlier sketches into a series of canvases. S2E215: "Flying Creek Valley with Dennis J. Evans"
Carved some 10,000 years ago by glacial runoff, the Qu'Appelle / Flying Creek Valley is a distinctive deep and narrow valley system unique in Canada's southern prairie. Inspired by ancient cultures, muti-disciplinary artist Dennis J. Evans has built an observatory here to study prairie light. Perched on the edge of the valley, this straw-bale structure provides a multitude of frames for the ever-changing landscape and a canvas for the dance of light and shadow. In this episode, Evans reveals his approach to art and life while his photographs capture the beauty of the place. S2E216: "Wheaton Valley with Keith Wolfe Smarch"
Wheaton Valley, Yukon Territory is an area of sparse beauty, abundant wildlife, and archaeological significance. This remote mountain landscape amidst the clouds is also the ancestral hunting ground of the Tlingit people. Tlingit carver Keith Wolfe Smarch shares the story of his artistic journey and the traditions of his people as he creates an intricate wooden spoon. S2E217: "Frenchman River Valley with Susan Shantz"
On the edge of the Saskatchewan prairie are the whitemud formations of the Frenchman River valley. These 66 million year old remains of a semi-tropical coastal delta have escaped the forces of the last ice age. Amid these raw forms overlooking the valley, installation artist Susan Shantz transforms everyday manufactured materials to explore the immigrant woman’s experience in a new land. Her subtle installations examine our cultural and geographic history and the ongoing tension between the forces of nature and culture. S2E218: "Peace-Athabasca Delta with Doug Haynes"
One of the largest freshwater deltas on earth, the Peace-Athabasca is a UNESCO world heritage site. Hundreds of thousands of birds including the endangered whooping crane come here to nest. From the air and on the ground, Alberta painter Doug Haynes draws upon the shapes, textures, and light of the Delta for a series of paper works. He provides us detailed insight into his process: transforming his initial impressions and experiences of the landscape by manipulating scale and media through collage. Later in his Edmonton studio, Haynes further re-works and refines the original works on paper into large-scale canvases. S2E219: "Haida Gwaii with Shirley Wiebe"
Haida Gwaii is an archipelago of more than 150 islands on the coast of British Columbia. An area rich in cultural history, mythology, and natural beauty, it has been home to the Haida people for centuries. With the country's highest rainfalls, some of the most ancient old-growth forests, and 39 species found nowhere else on earth, the islands are often referred to as Canada's Galapagos. Shirley Wiebe's installation art is concerned with light and the integration of material and landscape. Working on the shores of Haida Gwai'’s Naikoon Provincial Park, Wiebe creates luminescent structures that delineate the sculptural effects of the ocean’s wind, weather, and tide. S2E220: "Birch Forest with Sally Milne"
Birch is endemic to the world’s boreal forest regions – including all Canadian provinces and territories. The beauty and tranquility of the northern birch forest has long been a comfort and inspiration to Woodland Cree artist Sally Milne. 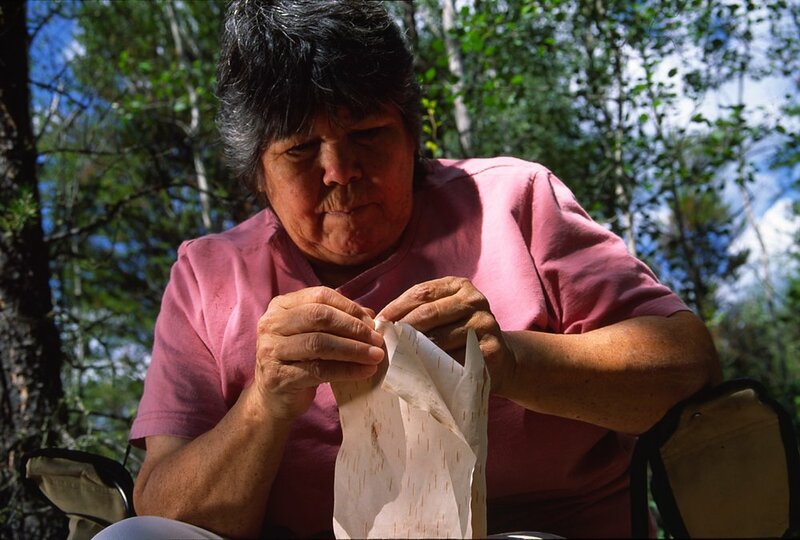 Raised on the traplines, Milne is a respected Medicine Woman and internationally recognized birch bark biter. She sees herself, and her work, as a bridge between the traditional ways and the future of her people. While creating her unique pieces for us, Milne also shares her values and philosophy, which form the basis for a life of fulfilment. S2E221: "Northwest Angle with Tim Schouten"
Northwest Angle has long been a point of convergence. Before contact, this area was a meeting point for many Aboriginal people. During the fur trade it lay on the main route into Manitoba and the west. It is also where the borders of Manitoba and Ontario meet Minnesota. It was here, some 130 plus years ago, where the historic Treaty 3 (also know as the Northwest Angle Treaty) was signed between the Government of Canada and several Ojibwa First Nations. Places with historical significance are at the core of painter Tim Schouten's current body of work. In this episode we see how Schouten approaches the landscape as a historical document. 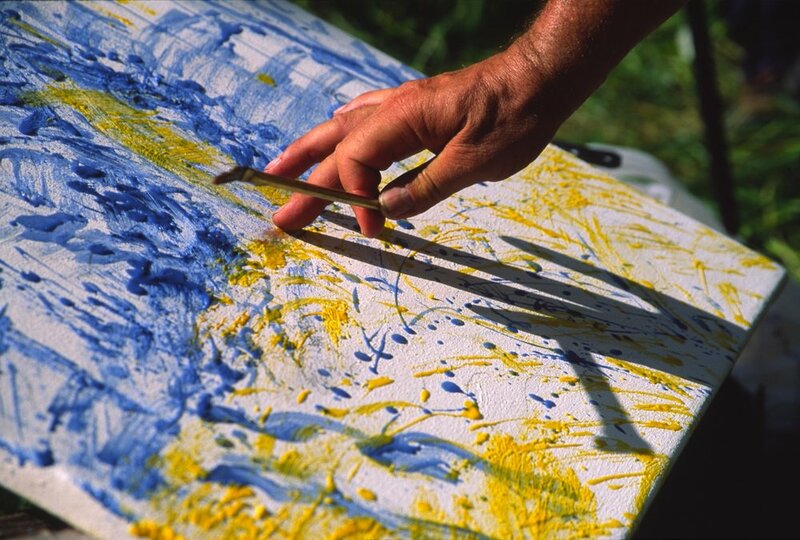 Using encaustic (wax), Schouten begins several impressionistic canvases while at Northwest Angle. Months later we visit his Winnipeg studio to see the results of his work. S2E222: "Pocket Desert with Richard E. Prince"
As the northern extremity of Mexico's Sonoran Dessert, the pocket desert is a rare habitat in Canada. Here you will find rattlesnakes and scorpions, burrowing owls and sage thrashers, greasewood and mariposa lilies. The desert's dry air and cloudless skies has long been valued for celestial observation. Vancouver sculptor Richard E. Prince is renowned for his elaborate, and sometimes mechanized, artworks that examine natural phenomena. In this episode, Prince presents his “stargazers” work - precision machined viewing devices with which he sites the morning and evening stars of the desert sky. S2E223: "Southern Manitoba Prairie with Colleen Cutschall"
Colleen Cutschall is a painter and installation artist of Lakota heritage. Her work has long been concerned with the history of first peoples. This is not a history written on paper but history seen on the land and rocks, the skies and stars, and in the sprits of her people. Her facination with "archaeo-astronomy" guides us to otherwise unknown sites in Southern Manitoba. She explains how the countless ancient earth mounds, altered boulders, petroglyphs, and cairns, were created for ritual or practical purposes. Many of these sites correlate to the stars and were likely used for astronomical observation. Cutschall creates a mural-like painting of these sites on a teepee liner canvas, which she describes as "an earthly reflection of what is in the cosmos." Finally her painting/liner is hung on the inside of a majestic teepee in the prairie. S2E224: "Great Bear Rainforest with Diana Lynn Thompson"
The Great Bear is the world's largest remaining contiguous coastal temperate rainforest. Due to its position between the ocean and the towering coastal mountains, as well as high levels of rainfall, trees typically climb to 300 feet and can be as old as 1,500 years. The richness of this rare landscape is an inspiration for Diana Lynn Thompson. Her history as a naturalist and her personal connection to the forest informs her work which comments on the way that we coexist with nature. We follow Thompson as she creates subtle and ephemeral installation works that become a living breathing part of the rainforest. S2E225: "Waterton Lakes National Park with Tom Willock"
Waterton Lakes National Park marks an abrupt convergence of the Great Plains and the Rocky Mountains. This dramatic meeting of ecosystems and landforms makes the Waterton area one of the most biologically and geographically diverse locations in Canada. Tom Willock's rich black and white large-format photographs capture the texture and drama of this landscape. Underlying the aesthetic value of these images is a unwavering concern for the preservation of nature. "...when I photograph something, I secure it in my own mind. I secure it for myself. Just to show what we really are losing -- or saving. These photographs are real. These aren't imaginary places this is what our earth looks like." S2E226: "The Forest with Peter Von Tiesenhausen"
"I use the landscape and nature because it's right here. I understand it better than I understand anything else. It becomes my philosophy. It becomes my artwork. It is co-creating with me." Big Sky Documentary Film Festival (February 14-20, 2005), Episode 226: "The Forest with Peter von Tiesenhausen"